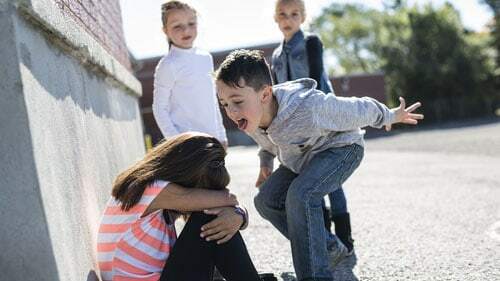 Bullying can have a long standing impact on the physical and emotional welfare of our children and comes in many forms, from name calling to physical altercations to cyber bullying meant to make it impossible for the victim to find an escape from the constant harassment. The best way we can solve the problem is to learn how best to prevent it from happening in the first place and for parents, teachers and school administrators to all recognize their role in bullying prevention. The CDC conducted a survey in 2015 to determine how widespread bullying is and discovered that one in five high school students reported being bullied at some point. 15% of bullying occurred electronically and this figure is expected to grow as more and more children have access to cellphones and mobile technology. The use of these devices has become ubiquitous, and while there are many benefits to mobile technology, it also makes it possible for bullies to continue assaulting their victims long after school hours have ended. The four primary forms of bullying are physical, verbal, emotional and cyber bullying. Victims of bullying often withdraw from social interactions with others and may begin to perform poorly in school and suffer from anxiety or depression. Many teen suicides are the result of persistent bullying that makes the victim see ending his or her life as the only escape. It is important for teachers and administrators to receive proper anti-bullying training so that they can more easily detect and react to bullying in and out of the classroom. The steps that should be taken include the following. Performing an assessment of the bullying situation in your school to learn where you are succeeding or falling short in your efforts. Keeping an open dialogue with parents and students. Bullying victims may not come forward out of shame or fear, but their peers and parents can often identify signs of a problem or make those in authority aware of persistent harassment, cyber bullying or physical altercations. Create and implement a code of conduct that prohibits bullying and provides a system through which students can report bullying. Reinforce tolerance and inclusion while making it clear that intolerant or abusive behavior will be met with disciplinary action. Include bullying prevention in class curriculum and teach students how to assert themselves and report instances of bullying. Respond quickly to allegations of bullying and keep the parents of every child involved in the incident in the loop. You can play an instrumental part in bullying prevention by teaching your children how to react to bullying and discussing why it is a problem. Familiarizing yourself with school policies and remaining in touch with your child’s teachers will allow you to provide clear instructions on how to report an incident and reach out to those in a position to assist. It is also important to make it clear to your children what the consequences will be if they are ever found to be bullying another child. When a child possesses the need to bully others, this is often the sign of a problem at home that requires attention. Your child may need to undergo counselling to get to the root cause of his or her need to treat others in a destructive manner. Everyone can contribute to bullying prevention through education and the ability to speak up when someone is being assaulted or harassed. Communication, education and clearly defined policies should reduce the chance that your child will be bullied or participate in bullying behaviors that would harm others.